Millennial pink is everywhere these days as pastel pink makeup, clothing and accessory items continue to #trend. The obsession has even carried over into the food world with Instagram-worthy toast creations, smoothies and even donuts setting social media ablaze. But the most definitive proof we haven't yet reached peak millennial pink? 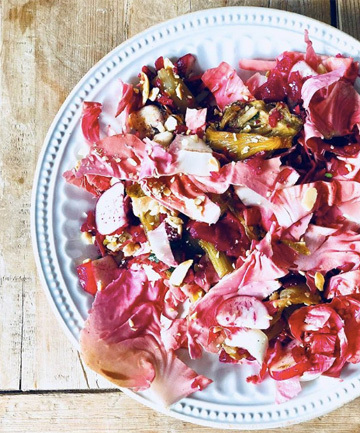 The feed-friendly Italian radicchio otherwise known as pink lettuce. Despite being aesthetically pleasing online, celebrity chef Lauren Koeppe notes that this pink food item isn't actually lettuce at all, it's a type of bitter radish called Radicchio del Veneto. "Primarily from Italy, there are also some spots here in California that grow the pinkish-colored lettuce. It's basically the same thing as a radish — similar in properties and it has a bitter and slightly spicy taste," says Koeppe.